People fear double-digit stock market declines. I see them as opportunities. The US stock market has been more volatile lately. And my portfolio is better off because of this volatility. I just finished reading Nassim Taleb’s book Antifragile. He has got me thinking about my investing and how to make my portfolio antifragile. 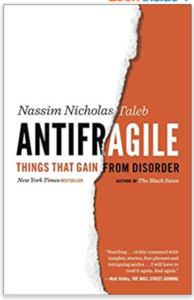 Taleb defines antifragile as things that benefit from disorder (or volatility, chaos, etc.) Up to an extent. Fragile would be the opposite — things that break because of disorder. Antifragile is different in concept than robust because being robust means disorder doesn’t damage it. Being antifragile means going one step further — it gains from disorder. What might be considered disorder in our investing context here: Higher market volatility and investor panics or manias. How do I make my portfolio benefit from disorder? First, let’s spell out some basic principles of long-term stock investing. These are my foundational beliefs. If you agree with them, the rest of this article will also make sense. The stock market is unpredictable by nature. We can’t know in advance what it will do. However, stocks over the long run will always follow businesses’ earnings which in turn depend on the country’s GDP. The U.S. economy will continue to grow albeit in fits and starts — expansions and recessions will come and go. These are normal phases of a free-market capitalistic economy. Real investors don’t fear a recession. The stock market as a whole cannot go to zero unless the country itself ceases to function. Specifically, in the context of the United States, I believe that its stock market cannot go down to zero causing all our investments to vanish. It follows then that as long as we’re not forced to liquidate our positions and are able to wait out a down cycle (no matter how severe), we won’t have permanent losses. We can get rough estimates for the stock market returns based on historical evidence but never exactly know what it will do in the near term. Why that market crash didn’t happen? A vast majority of times, when the US stock market goes down, it drops by 10%, 20%, may be even 30% and then recover. On occasions a rare event (in Taleb’s lingo a fat-tail or negative black swan event) may make the market go down by 50% or more. What returns can we expect from the US stock market? Dry Powder. I use a dry powder strategy where I keep certain amount of cash in my portfolio — ready to be deployed when the market goes down. I have previously written about my dry powder strategy here. I use a set of rules to decide when to deploy dry powder — rather than rely on intuition or technical analysis — neither of which I believe have much benefit to a long-term investor. Besides dry powder cash, I also keep a rainy-day fund in cash (or in highly liquid investments). This is for my family’s living expenses in case my portfolio is not earning enough income and I lack another source of income. The size of a rainy-day fund is also subjective. I keep roughly 3 years’ worth of annual expenses in it. How much cash (both dry powder and rainy-day funds) is good? This depends on each individual investor’s situation and risk tolerance. I’d say somewhere between 10% to 25% of portfolio value can be in dry powder cash. Currently, I have about 12% cash in my portfolio. At the same time, I tend to be somewhat aggressive and risk tolerant in my approach. My portfolio only contains assets that I am pretty sure I won’t need for consumption in next five years. As you can see from my rule-book, I deploy cash gradually as the market goes down by a certain percentage off its previous peak. Judging by its history, the US stock market frequently goes down by 10% to 30%. When it recovers back to its previous peak, I replenish my dry powder by selling some stocks. If it’s a short round trip, I’d have deployed and then recovered my dry powder in less than 12 months. And making profits while doing so. When the stock market has even deeper drops — say 30% to 40% — it might take longer for it to recover. In that scenario, my dry powder may stay deployed for more than one year before I have a chance to take profits. But that’s ok with me. I am patient. I know I will make money eventually. So, you can see how my portfolio makes money when stocks are volatile. I make more profits when stock prices are fluctuating than if they stay quiet. And this is what makes my portfolio antifragile. In other words, I am better off when the market moves about a lot. Some market history: Take a look at this chart. It shows US stock market annual returns for every year since 1980. 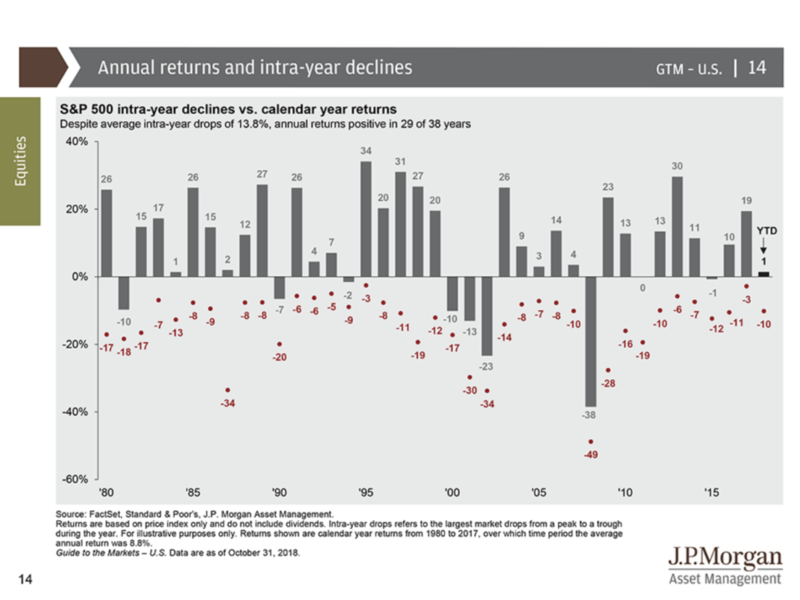 It also shows intra-year market drops (how much stocks dropped within each year from peak to bottom). I had also shared this chart in a previous blog post here. How many double-digit intra-year drops do you see? Many. Almost every year. These are all excellent opportunities for my portfolio to make money by deploying the dry powder. What’s notable from the chart is how stocks dropped by double-digits even in the years that ended in overall positive gains. This may surprise readers because most investors tend not to remember those declines as long as the market recovers before the end of the year. These intra-year drops happen frequently. Just this year, we’ve had stocks (the S&P 500) drop by 10% twice — first in February and then in October. The stocks had recovered fully by August from the first drop before falling again in October. I was able to deploy my dry powder cash twice this year — and the year hasn’t ended yet. A big bad market drop? What about those rare black-swan like events where stocks drop suddenly and by a huge amount? Is my portfolio protected against those? It’s difficult to predict how much stocks would drop in a rare fat-tail event like that. I look back to last two big drops in the stock market for some guidance. In both the 2000 and 2008 crashes, stocks dropped by about 40% from their previous highs. And they didn’t complete full recovery for another 5 to 6 years. I consider them black swan events. So, if stocks were cut down again by 50% in a future event, how’d I fare? For my portfolio to suffer permanent harm, I’d have to liquidate my holdings when stocks were below my cost. Otherwise, I’d be fine just holding them throughout the downcycle. Remember that I have done this twice already in last 20 years. As I have blogged about it in this post, I have gone through both the 2000 Tech Crash and the 2008 Great Recession with my holdings largely intact. 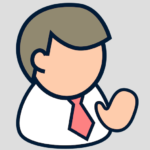 In fact, I had added to my portfolio on both occasions from on-going savings. It’s not pretty while you were in the midst of a severe downturn but looking back through the rear-view mirror, I had done fine through them. In fact, I came out well ahead of my own expectations. If stocks were to go down again by 50%, I’d have deployed all my dry powder reserve. It’s possible that the market may not fully recover to prior highs for another 6 — 8 years. If this were to happen, it would be even worse than previous two big market crashes where stocks took about 5 years to recover completely. Because I’d have deployed dry powder gradually, hopefully some of my positions were bought at close to bottom prices. So even if the market doesn’t fully recover for a few years, it’d have likely moved up from its very bottom — and hence I will have some profitable positions that I could then sell just in case I need to. But for the most part when stocks are down so much, I’d rely on my rainy-day funds — in addition to dividends and options income. I don’t use any borrowed money (in other words, leverage) in my portfolio. I don’t hold any positions that are not cash secured (such as short stocks or uncovered stock options) either. I won’t ever be forced by my broker to liquidate any positions. My only risk of permanent loss comes from forced liquidations if I am running out of cash for today’s consumption. As I explained, that is not likely. Antifragile, indeed. So, going back full circle to my original contention, my portfolio is antifragile — it thrives on market volatility. I should also come out fine from a deep negative fat-tail event. So long as I keep my head and not succumb to negativity that comes with a market downcycle. But this dry powder thing is complicated. If you are young, you have time on your side. If you are a net saver, you just need to keep investing in stocks with your savings and stay patient through the ups and downs. 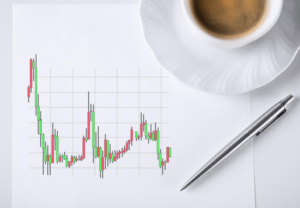 As I showed in this blog post, even if I had started dollar-cost averaging at a market peak that wouldn’t be reached again for another decade, I’d still have done fine. « Why that market crash didn’t happen? First thanks for the question. Do you mind if I post my response (and your question) as comments to my Nov 26th post? It might help others too. As I said in that post, I see dry powder cash to be within the range of 10% to 25%. I currently have about 12%. I tend to be fairly risk tolerant and have experience doing it for years. But there is no precise science behind these numbers. It ultimately depends on your specific situation, your time horizon, and risk tolerance. Having said that, I also believe keeping 40% cash is way too high. I was inspired by Morgan’s dry powder idea but not his cash allocations. I like Howard Marks’ views on market cycles. I agree that one could tweak dry powder allocations depending on where we think the market cycle stands. Perhaps if one feels strongly that we are in the eighth or ninth innings here, his/her dry powder allocation should move up. This would make sense, yes.